For the past few months, maybe even the past year, I've been complaining about a lump in my upper right abdomen. The first time I saw the doctor he really could not feel anything and ordered an x-ray. That was clear. And a few months after that I started having consistent pain in the area and I felt the lump was growing. Instead of going back to my primary care doctor, I got a referral to my gastroenterologist who ordered a CAT scan. An abdominal wall mass showed up, but it could not be seen very clearly on the films. I was referred to an oncologist surgeon to have it removed. When I say "it" please note that going into surgery they could not tell me what the tumor actually was. It was a little intimidating/scary visiting an "oncologist". Also interesting, over the course of the last few months -- and bring seen by three different doctors-- I have heard "it" being called a nodule, tumor, a lesion, and an abdominal mass. So back to MY surgery details…I was expecting my incision to be about one inch long. 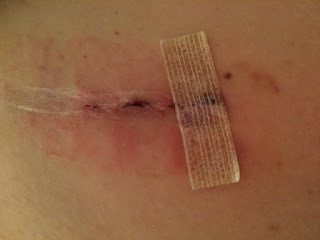 I was quite surprised when I woke up from surgery to find this incision (see picture below)! It was nearly 2-1/2 inches long! I've also had more pain than I expected. (As a side note, my outpatient surgery lasted about 40 minutes. I was giving MAC Anastasia which is also considered twilight, and not general anesthesia.) This is how the incision looked on my upper abdomen the day of surgery. Day 1/Tuesday: Surgery (EXCISIONAL BIOPSY RIGHT SUBCOSTAL NODULE) started at 8:30am and was done around 9:10am (40 minutes). I was released from the ambulatory center at 12:30pm. I was given a RX for Hydrocodone-APAP5 -325MG (2 pills every 4 to 6 hours). Day 2/Wednesday: Bruising of the skin now showing (ouchie). 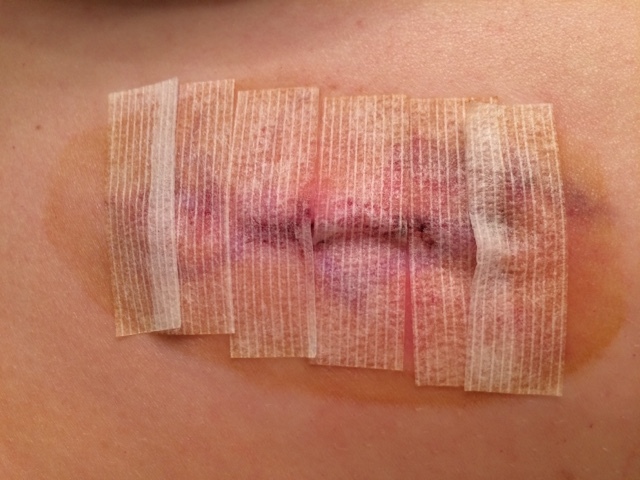 Today, I noticed areas of numbness around the incision. I will not know for a few weeks if this is temporary or permanent nerve damage. I stayed in bed Tuesday (surgery day), Wednesday, Thursday, and Friday. I got out of the house for a couple hours Saturday and again on Sunday. I have not been able to take a bath yet, only quick showers. Also I have not yet been able to sleep on my right side. I've mainly been sleeping on my back or left side. One of the thing, at this point it feels good to lay down or stand up, but sitting is the most difficult position for me. 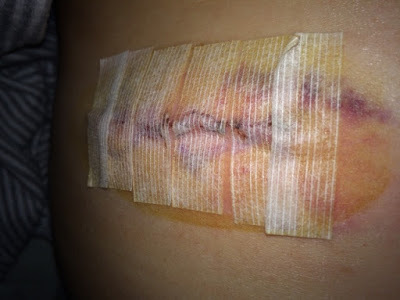 Day 6/Monday: 2 of the 6 bandages have fallen off and the bruising is almost gone. I also drove for the first time today since my surgery. I put a little pillow between my stomach and the seatbelt. 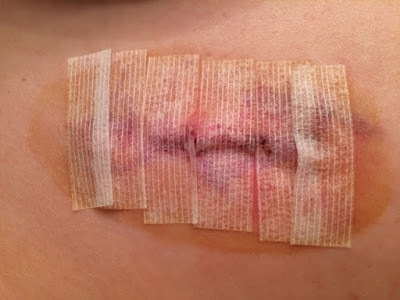 Day 9/Thursday: Only one surgical strip is still left on the incision. I still feel pain when I try to lay on my right side, bend over to try to pick something up off the ground, or when I try to turn my body at an angle. 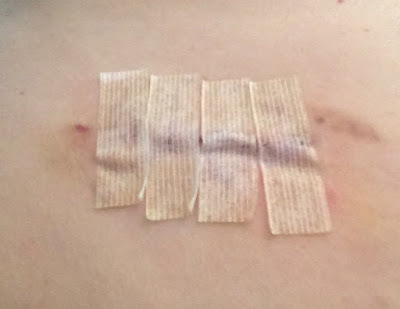 Day 10/Friday: I had my post-op appointment today. I found out my tumor was a "capillary hemangioma and lipoma". I actually had TWO small tumors removed. He also said they were pretty deep in the muscle. My surgeon does not think it will grow back ever. (I have read varying opinions online). So, there's my story. If you have any questions, please leave a comment and I'll be happy to get back in touch with you!